In continuing to celebrate Let's Go Camping month - I've asked five bloggers to share their favorite campsite and a little bit about why they love to go camping. Enjoy! Cameron and I love camping because it brings us closer to the trailheads, encourages us to rise early, and gives us spectacular views at the fraction of the cost. In the process of planning our Southwest adventure we knew we wanted to include Zion National Park. We are familiar with the National Park Service and know they offer easy to navigate websites, helpful rangers and well kept facilities. 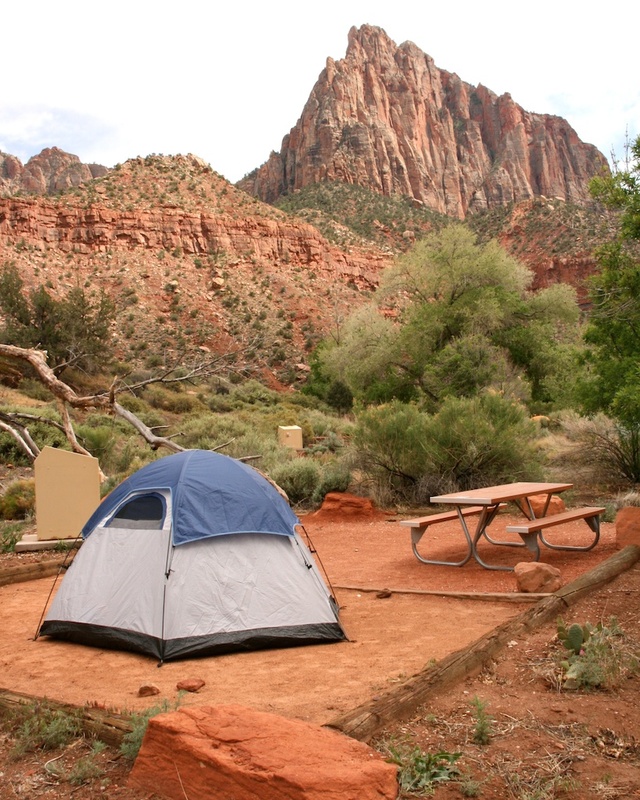 We chose Watchman Campground because it was located within the park, was located close to the park's shuttle system and offered some tent only walk up sites. In general, we prefer not to pitch our tent right next to our car or someone else's motor home, so we selected the tent only, walk up sites in Loop F. Each site had a picnic table, flat area for your tent and an enormous bear box (large enough to hold two large backpacks, plus additional food). With a view like this and price point of $16.00 per night, we knew we had scored ourselves not only a deal, but a killer view. Within minutes from leaving our campsite we were boarded onto one of the park's shuttles and heading to the trailhead to begin our hiking adventure for the day. Location is more important to us than amenities, but there was a bathroom and running water located right next to the Watchman Campground. I'm Mister Travelette and I love food. Especially good food. But as Adina will tell you, I'm not exactly picky and I'm also fairly lazy. Before we got married I would survive on peanut butter sandwiches (yes, too lazy for jelly - plus it makes the bread all soggy) and chips (oh do I love chips, but that's a story for another day).